Hello hello! 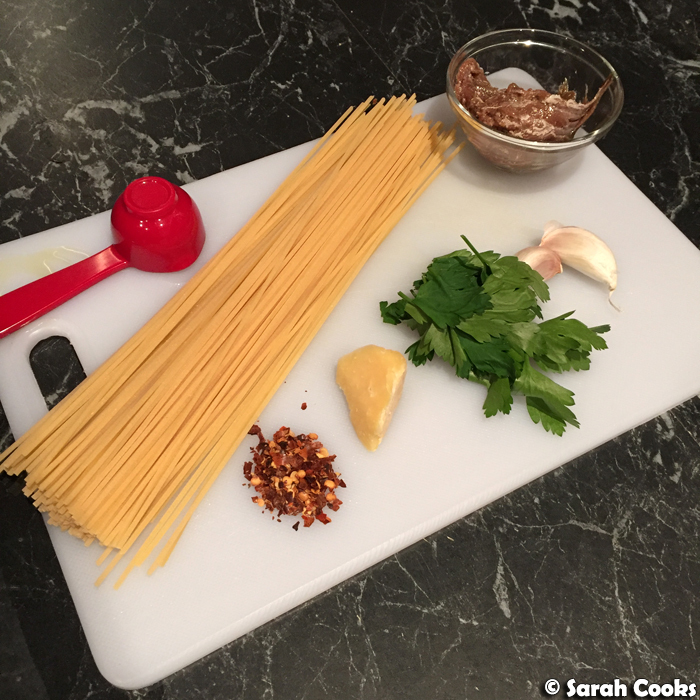 Quick recipe post for your enjoyment today! A delicious anchovy spaghetti. 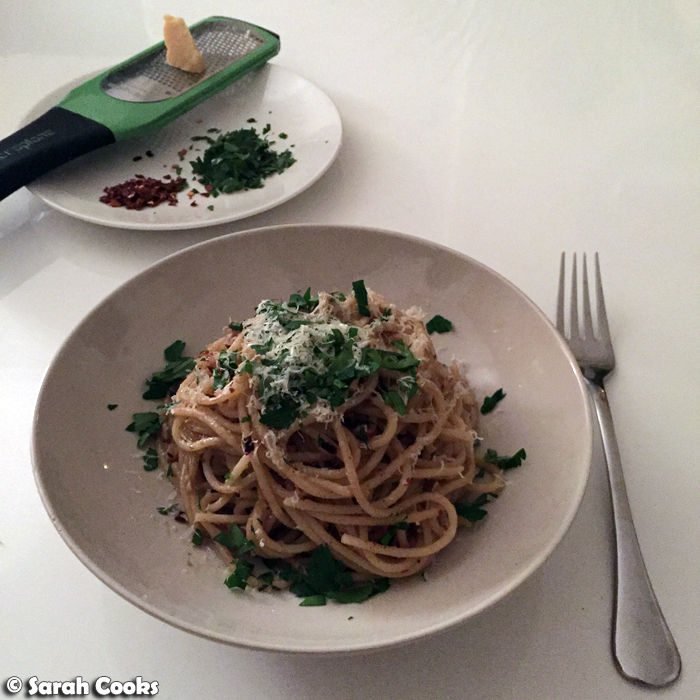 Or, more glamorously: Spaghetti con le Acciughe. 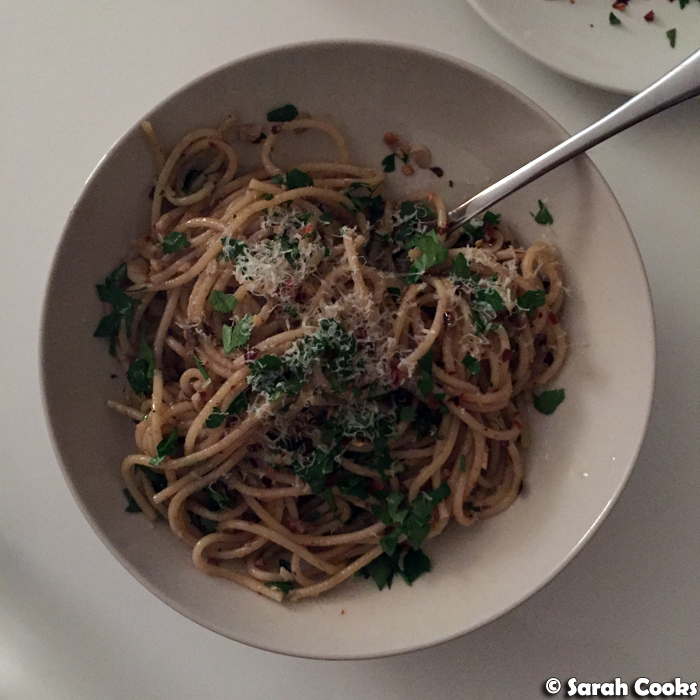 After having a serious anchovy craving for some months, I finally made a gorgeous bowl of anchovy spaghetti this week for a quick and easy midweek supper. I loved it so much that I just had to blog the recipe. My initial plan was to wait for a future weekend, when I could make the dish again and photograph it with my proper camera in lovely natural light. However, sense soon came over me and I realised this would mean weeks before I could share it. So, an excellent recipe and some quick snaps from my iPhone it is! This dish is a perfect weeknight supper. It's so easy, and most of the ingredients are storecupboard. (I love the fresh parsley, but I'm sure it would be fine if you left it out). And it's fast too - it actually takes less time to cook the sauce than it does to cook the spaghetti, and the pasta itself forms the bulk of the dish. (Just like so many of my favourite pasta dishes... spaghettini con cacio e pepe, bacon pasta, spaghetti aglio e olio, and to a lesser extent, linguine alle vongole or spaghetti carbonara). And then you add pepper (no need for salt), chopped parsley and Parmesan to serve. I believe that it's traditional in Italian cuisine to avoid pairing Parmesan cheese with seafood, as the strong flavours of the cheese overpowers the delicate seafood. However, all recipes I've ever seen for anchovy spaghetti include Parmesan in the ingredients. I guess it's because anchovies are punchy little flavour bombs - no chance of them being overpowered at all! And obviously, this dish is suitable for anchovy lovers only! Pot a large pot of salted water on to the boil and cook the spaghetti according to packet directions. Meanwhile, peel and finely slice the garlic. Place the olive oil and garlic in a heavy based frypan over a low heat, and cook for a few minutes or until the garlic is softened. Add the anchovies and turn the heat up to medium. Stir the anchovies well to mash them into a paste. Add the chilli flakes and stir to combine. Remove from the heat. 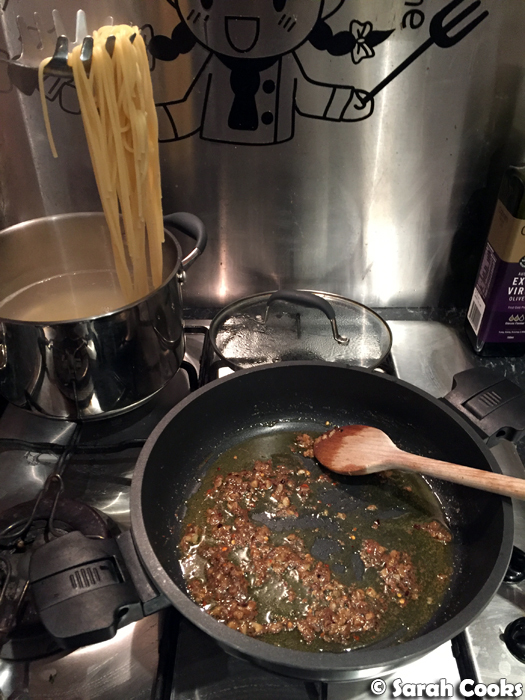 When the spaghetti is ready, drain (reserving a mugful of cooking water) and add to the pan with the oily-garlicky-anchovy paste. Stir to coat the spaghetti in the mixture, adding a splash of the cooking water if necessary. Transfer to a warmed bowl, and top with pepper, parsley and parmesan cheese. For other anchovy pasta ideas, try Nigella's bigoli con salsa (from Feast), or the excellent pasta con acciughe e pomodoro from Jamie Oliver's Jamie's Italy. Yum so easy and so tasty looking!